So, in this small tutorial I want to introduce how to create basic audio app and generate sine wave by formula. Firstly want to say a few words about JUCE. 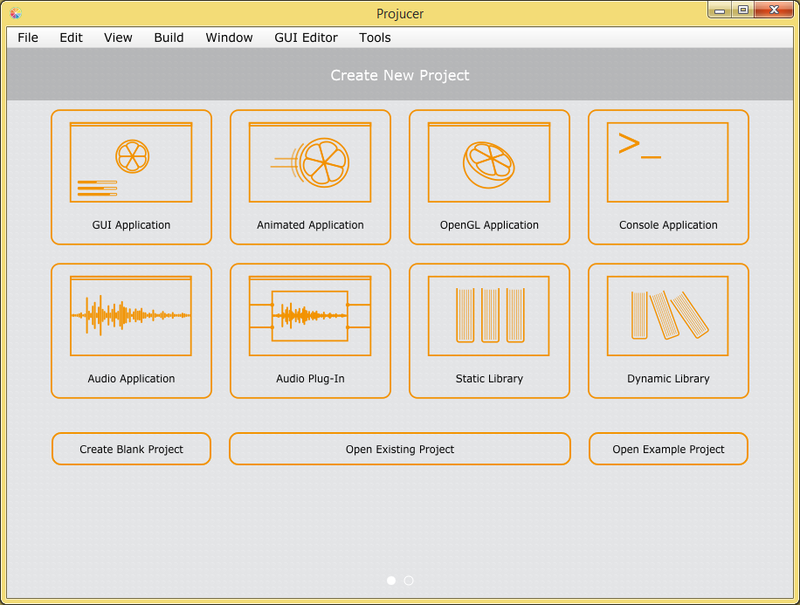 JUCE is the C++ library to develop cross-platform, interactive audio applications with graphics. JUCE supports Windows, Mac OS, Linux, iOS and Android. Also it gives you possibility to use predefined or custom UI. You can build VST, VST3, AU, RTAS and AAX format plugins with ease, and host VST and AU plugins inside your own applications. JUCE provides full MIDI support, new Multidimensional Polyphonic Expression protocol and Open Sound Control (OSC). Step 1. 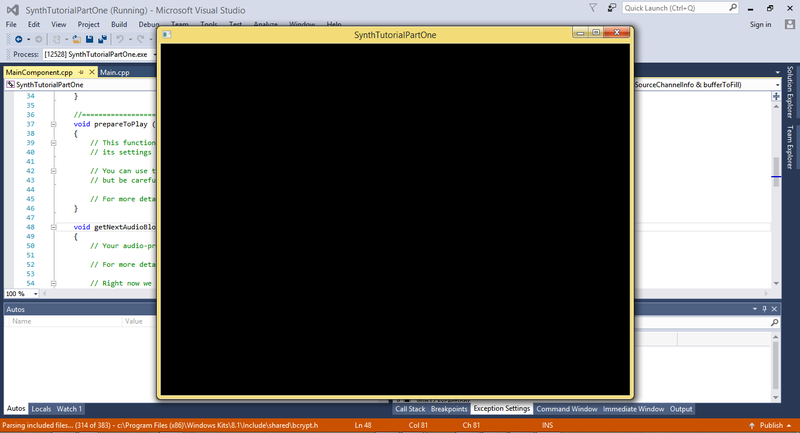 Download Visual Studio of you are on Windows (which version you want). I use Visual Studio 2015. Step 3. Create simple audio app. JUCE gives us great tool called Projucer. 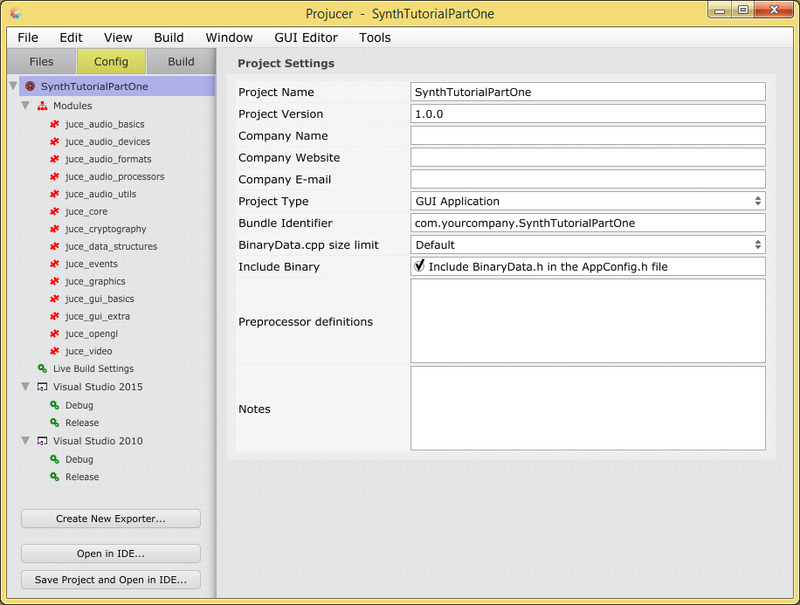 It can create project templates with basic code, configure your build solutions and manage your project configurations. Open the Projucer and click New Project. You should see a window as below. Quick description what is Audio Application. Full description for all project types are listed here. We need Audio Application project. Just write the name of you app, select appropriate target platforms and click Create… button. After this window you should see you project window. You can add or remove modules, change your solution configuration and many more. For now just leave it as is. 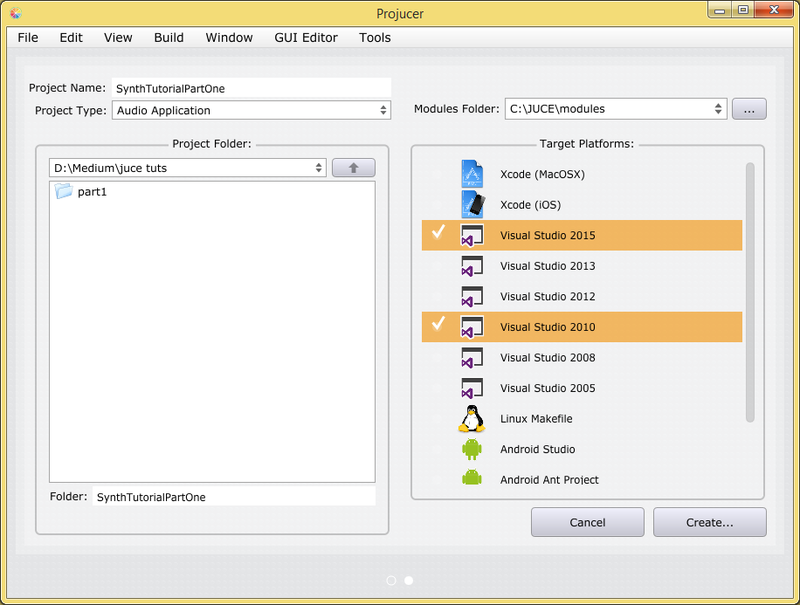 To open your newly created project in Visual Studio just press Open in IDE… button. Great, we have a project template which successfully builds and runs on your machine. Now we want to add some code to generate simple sine wave. What parameters can be customized? Okay, we have formula and need to translate it into the C++ code. Firstly we should create private variables in file MainComponent.cpp. Delta time is the smallest time value added to time variable, like a time step. Next step is to initialize them in prepareToPlay(). This function is called once before audio stream starts to be processed. Here we set default values for our member variables. Yes, we can do this in the constructor, but currently it is not so important. Sample rate stands for samples per second. For example, most commonly used is 44100 Hz. In our case we need to know how much time passed from one sample to another. This time is constant and remains stable, but depends on sample rate. So if our sample rate is 44100 Hz, it says that we should take 44100 samples per one second. If we divide 1 over 44100 we get delta time between samples. This is the delta time value. Include Slider and Label classes in MainComponent.cpp file and create class members in private section. After that we need to initialize this GUI elements in the class constructor. And by the way fix windows size to smaller one. Please take note that we should also derive our class from Slider::Listener to handle slider changes and TextButton::Listener to handle mute button clicks. All slider changes by user will call sliderValueChanged(). When user clicks on a mute button — buttonClicked() method is called. Also we should write code in resized() method to update widget positions. Volume slider uses logarithmic scale. New parts with GUI code are listed below. Take note that this code should be intelligently merged to your existing, not replaced. Firstly I changed the range for volume slider in the class constructor. Also pay attention how I modified sliderValueChanged() method to convert volume slider value from logarithmic scale to linear. If you change frequency, you can hear audible artifacts and glitches, which are needed to be removed. They are created by rapidly changing frequency values. Therefore we need to smooth frequency change. I won’t be implementing this feature now. The main idea is to smoothly interpolate between current frequency and target frequency in some time period. Source code is stored on GitHub.